This historic pattern is a replication of the Via Appia, the oldest and most celebrated road built in Italy in 300BC by Roman censor Appius Claudius Caecus. These beautiful cobbles are offered in two sizes- see our Appian Cobble Stone Large Stone for a larger scale version of this pattern. 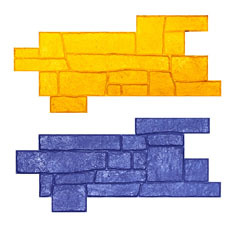 Our Appian Cobble Stone stamps consist of an A & B side. This allows for a more open, less repetitive pattern. The look of Old World Cobble with the durability of concrete.